“Forming part of what is considered to be the meeting point of the year, presenting new products to existing and potential clients in the domestic and export markets, establishing “quality” contacts, sharing ideas on the transformation of the market and discovering first hand the needs of clients to come up with individual strategies focused on them, and coinciding with professional users from other industrial sectors” are some of the arguments that companies have indicated to participate in Ferroforma. Over 429 exhibiting firms from 25 countries will be present at the event this year, where they will display their most innovative hardware, industrial supply and DIY products and services. Therefore, the companies join in the invitation of the event’s “revolution tools” claim, with new and smart solutions and advanced commercial solutions that will undoubtedly bring access to new international markets and client profiles. Industrial supply, manual tools, locksmith and security fittings companies are those who will be most represented at the event, followed by bindings, hardware and home, and occupational protection. In the exhibition area, supply firms for construction, electro-hand tools for wood, electricity and lighting, decoration, textile and drugstore, gardening and car accessories will also be participating. As for their origins, it is worth highlighting the participation of exhibitors from Germany, Italy, United Kingdom, Portugal, Sweden, Switzerland, India and Turkey. This year, the fair will be offering a specific meeting area for manufacturers and locksmiths, coordinated by APECS, Spain’s Association of Locksmithing and Security Professionals, in which 35 companies will be participating. The “APECS Area” will include spaces for demonstrations, meetings and technical training. The Ferroforma visitor’s campaign also reflects positive data. On the international scene, participation of purchasers from a total of 32 countries of great interest for the sector has been conformed, of which Argentina, Colombia, South Korea, United States, France, Iran, Morocco, Mexico, Nigeria, Peru and Portugal can be highlighted. 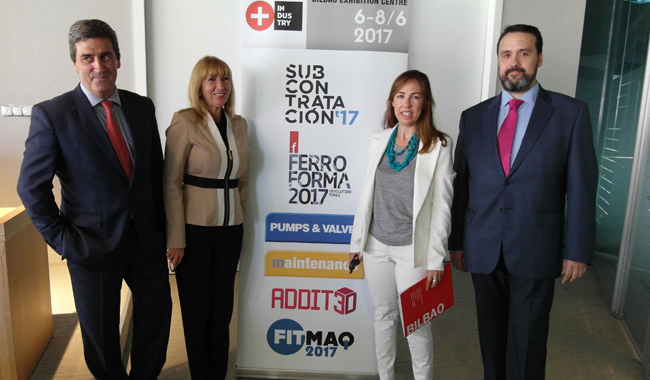 This year, as a new thing in Spain, Ferroforma has invited around fifty final clients within the framework of the purchasers programme, or in other words, those responsible for industrial supply companies and hardware stores. Finally, the leading national purchasing groups, cooperatives and large hardware stores will be present at Ferroforma, whereby they have been actively working in recent months in its promotion campaigns. Innovation will therefore be one of the axes of the Ferroforma Conferences, which will present a programme focused on e-commerce and many of the aspects related to its implementation. Trends in the digital era, business strategies related to consumer knowledge, choice of sales channels and analysis of client communication through new media will be some of the topics that will be analysed by companies like Black T, Barrabes, KPMG, Leroy Merlin Spain, El Corte Inglés, Pepsicola Company, MATMAX-Grupo Telematel, Cofares and Tu&Co. Furthermore, Ferroforma will once more be a dynamic meeting point with numerous spaces in which to interact and discover the most interesting products, innovations and market trends in very different ways. In this section, the 2nd B2B meetings can be highlighted. Following the success of its first edition, Ferroforma has organised these Encounters following the same approach, although the “matchmaking” has been carried out directly between exhibitors and visitors this year. In total, around 400 meetings between exhibiting companies and purchasers from the “hosted buyer’s programme” will be handled. The 3rd Innovation and Design Awards will recognise the products or services that respond brilliantly to innovation criteria in the market, efficiency and material quality, recyclability, new uses and applications, packaging quality, easy to use, accessibility of the design, maintenance and storage. Around 30 companies have participated in the competition with new smart security systems, high performance machinery in maintenance and cleaning, new cutting tools or the latest generation screws with high mechanical and anti-corrosive properties, among other products. The award ceremony will be held on Wednesday 7th June. The Inventions Showroom of the Spanish Association of Inventors will once more showcase its innovations in hardware, DIY and industrial supply in order to find partners to launch its products onto the market. This year, in the exhibition area, visitors will be able to see a tubular structures knotting construction system, a backflow device for sink plumbing and pipes in general, a trunk cutting machine, a system of folding bars to secure windows and doors in spaces with children, equipment for the automated control of stocks or a security device with a hidden lock, among other products. Finally, Ferroforma has incorporated a “passport” of orders and visits to stands, which will be stamped in accordance with orders and commercial interviews, and once completed, it will offer the opportunity to participate in different prize draws. Ferroforma includes the collaboration of AFEB, Association of DIY and Hardware Manufacturers, and ESKUIN, Hardware and Industrial Supply Cluster.